Vegans everywhere, it’s your day! Yes, it’s #WorldVeganDay and it’s a perfect excuse to treat your Vegan friends and family… or just try something new. So, we thought we’d help with 5 of our favourite Vegan recipes from the web. Veganism has become a trend in recent years, alongside being a health benefit for many, and a way of life for those who have intolerances to dairy or similar. Veganism has been proven to to provide some health benefits too, including a reduced risk of type 2 diabetes, high blood pressure, obesity, and heart disease. The Vegan Society website is a hot spot for any chef who wants to try something a little different, like this yummy red onion tart. 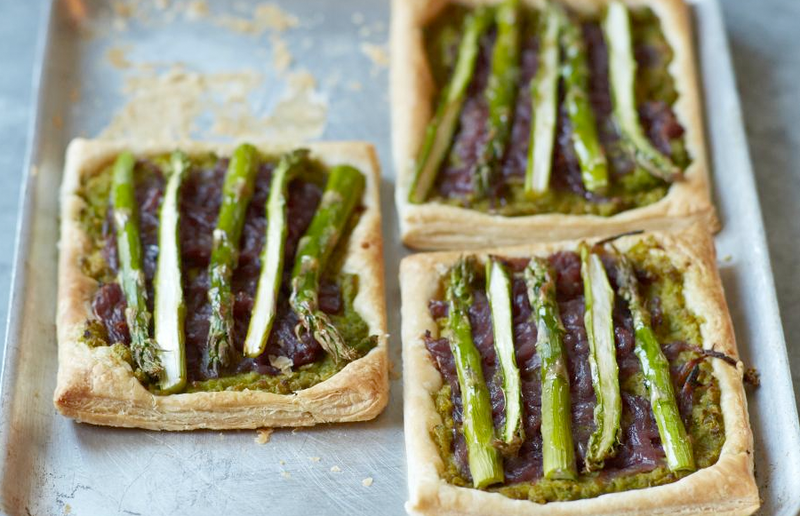 Using puff pastry, asparagus spears, red onions, and some herbs you can make a tasty treat vegan or not! Try it for yourself on their website here. Even though this is a smoothie, it’s actually eaten with a spoon as it’s pretty thick. 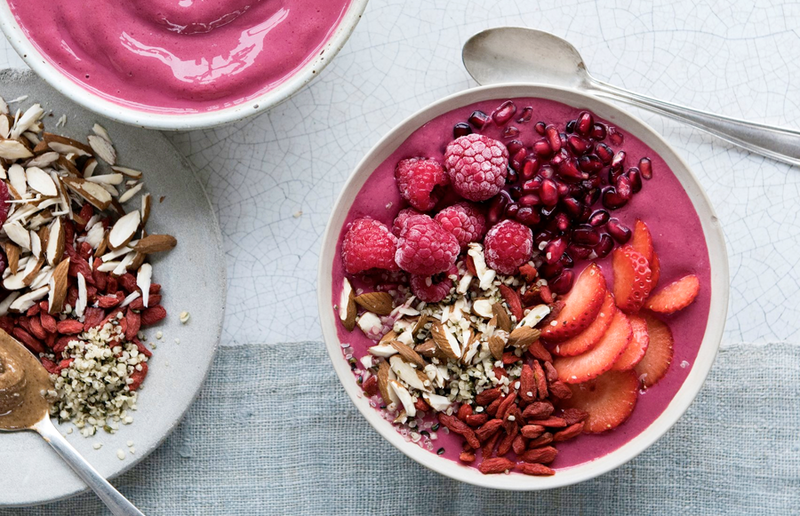 With many of us looking to ditch the carbs, a healthy breakfast smoothie is right up our street. The bowl creates a wider surface area, which provides the perfect canvas for generous scatterings of texture and flavour. This recipe from The Guardian, mixes prunes, beetroot, raspberries and strawberries with lemon, oats and a soya milk. Give it a go on their website here. Grab a few aubergines and make a mock steak with sweet peperonata salsa for the perfect vegan barbecue recipe. Ready in less than half an hour, it’s a easy after work treat. 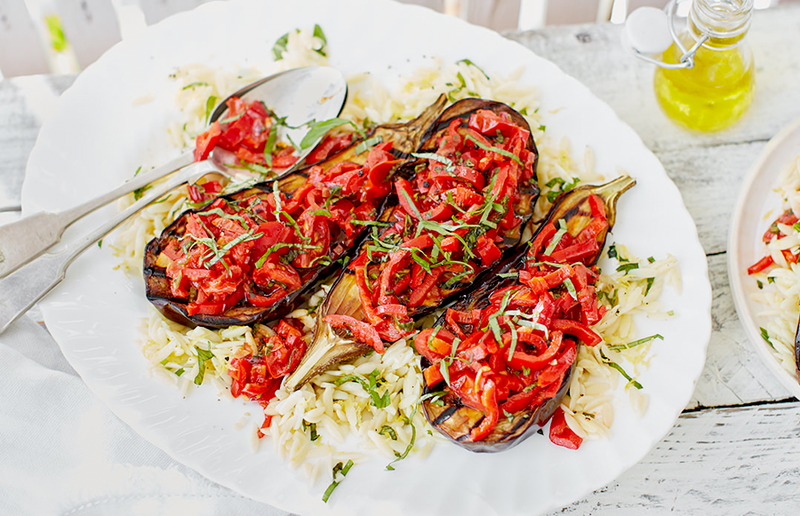 Another simple ingredient shopping list, get some large aubergines, a red onion, red sweet pointed peppers, cherry tomatoes, a garlic clove a tsp of caster sugar, red wine vinegar and basil leaves. Yum! Check it out for yourself at Tesco’s Real Food website. 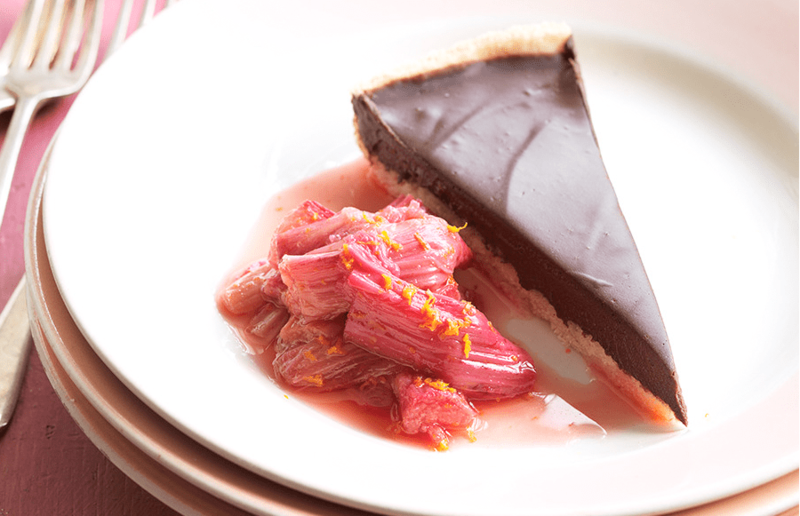 You won’t miss the dairy in this rich, decadent tart, which is beautifully offset by tangy rhubarb. Jamie Oliver sure knows his stuff, and his Vegan recipes are full of yummy treats you’d normally expect have to be filled with dairy. Using soya milk, cornflour and dark vegan chocolate this tart is a gooey treat. Try it for yourself here. Curry can be a tricky feat without chicken or meat. Not anymore. Here’s where the good old sweet potato comes in. 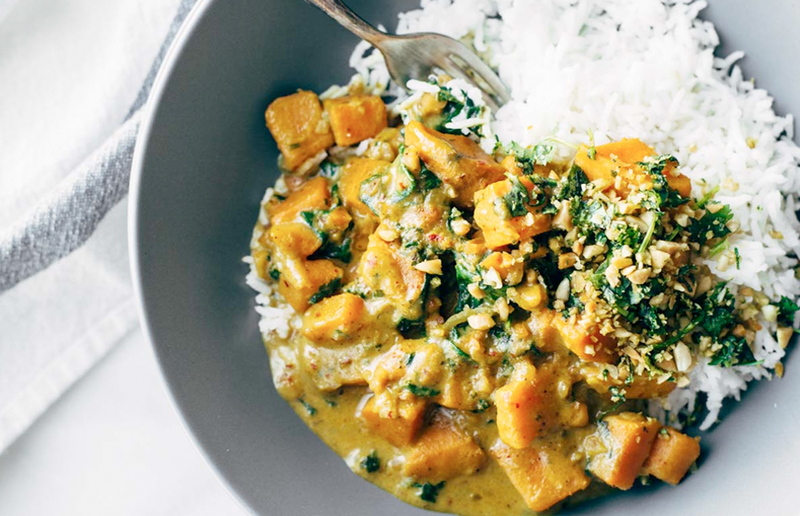 This creamy Thai Sweet Potato Curry can be made in about 20 minutes, and serves around 4. Or, you know… 2 very large portions… for yourself. Take a look at the yummy recipe and the ingredients over on Pinch Of Yum’s blog!